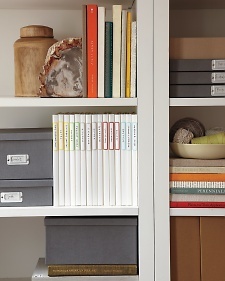 Came across this image in my MSL this month and loved these tiny white binders all lined up in a row. The binders are presentation binders that include plastic sleeves + color-coded labels. I've used my skinny binders in the past for storing cards by month- and then a subcategory by birthdays/holidays. Each sleeve/page is a month, and on that page I add a note with everyone's birthdays or holidays listed and possible card options for either their special day or that upcoming holiday. Another way I've used them is for takeout menus- that way I can circle/star dishes we liked, or cross out the ones we disliked to ensure we don't order them again. Love the idea of using them in my pantry as you mentioned for take away menus, quick recipes, school information etc. Great idea Thankyou. it's amazing how just white + some pops of color can make a space look so much more organized! I couldn't agree more. Love me some white and pops of color! Where can I find skinny binders like these? Do you have a link? I'd love to get some! People think organizing is difficult and it intimidates them to the point that they never get organized! Just seeing how simple some of these ideas are should help people get over their fears of being organized!